Antoine Griezmann saved France’s blushes. GERMANY are well and truly in crisis mode after they threw away a comfortable lead against world champions France. Meanwhile, a dramatic late winner meant Brazil claimed the bragging rights over their age-old rivals Argentina. The pick of the goals among the colossal fixtures came from volley machine Dries Mertens and Welsh set-piece wizard Harry Wilson. Here's a wrap of all the international action! 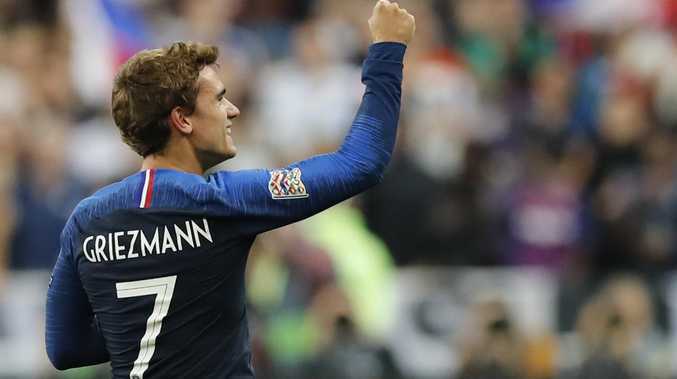 Antoine Griezmann got the better of goalkeeper Manuel Neuer once again, scoring both goals as France rallied to beat Germany 2-1 in the UEFA Nations League on Tuesday. Midfielder Toni Kroos gave Germany the lead from the penalty spot after 14 minutes and the visitors had chances to go further ahead before Griezmann equalised with a superb header in the 62nd. With 10 minutes left, Griezmann coolly put France ahead with a penalty for his 26th international goal. Belgium's forward Dries Mertens celebrates his goal. Dries Mertens fired the World Cup semi-finalists into a sixth-minute lead with a wicked volley, but Groeneveld marked his full debut for the Dutch by equalising before the half-hour mark. Miranda's stoppage-time header has earned Brazil a 1-0 win over archrivals Argentina in an international friendly in Saudi Arabia. Argentina were without star player Lionel Messi, who is spending an indefinite period away from the national team squad after their World Cup disappointment. Miranda headed over from a Neymar corner early on and then the defender saw an effort cleared off the line by Nicolas Otamendi. Tite's Brazil shaded a dull first half but Argentina started the second period on the front foot. Mauro Icardi fired an effort wide of the near post and interim Argentina coach Lionel Scaloni sent Lautaro Martinez on for Juventus striker Paulo Dybala, who failed to break his international duck on his 16th appearance. Casemiro zipped a dead-ball effort inches past the post as Brazil finished the stronger, with Miranda eventually pouncing in stoppage time, nodding in a Neymar corner. Wales midfielder Harry Wilson produced another brilliant free-kick following his heroics against Manchester United to seal a 1-0 Nations League victory against toothless Ireland on Tuesday. The 21-year-old Derby player, who shocked Old Trafford from a set-piece in the League Cup last month, curled in the winner with his left foot from outside the area just before the hour mark. The strike was out of keeping with a lifeless contest that looked to be heading for a goalless stalemate, with Wales badly missing Gareth Bale and Aaron Ramsey and Ireland struggling for inspiration after a miserable run of results.